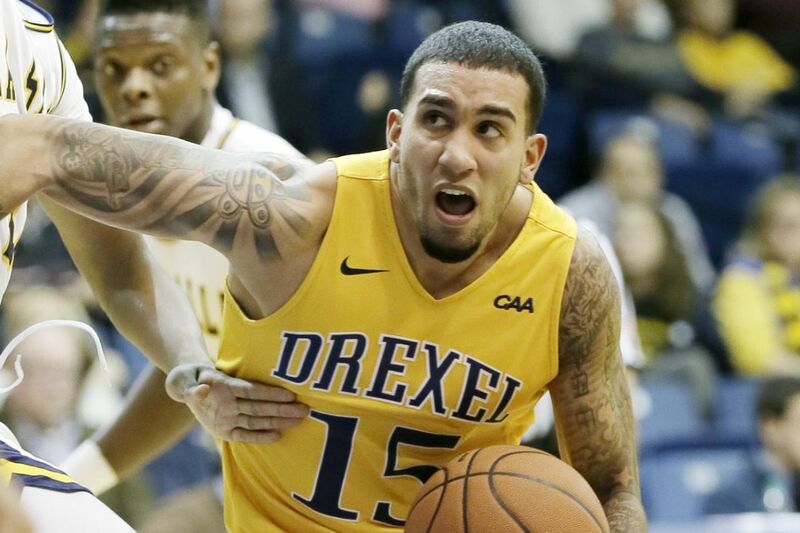 Drexel’s Sammy Mojica scored 22 points to reach the 1,000-point milestone. Under second-year head coach Zach Spiker, Drexel is more offensively potent than it has been in several seasons. The other end of the court continues to be a problem. For the fourth time in six league games, Drexel gave up more than 85 points, as Hofstra rolled to a 91-86 win in a Colonial Athletic Association game at the Daskalakis Athletic Center on Saturday afternoon. Hofstra (11-7, 4-2 CAA) shot 61.1 percent (33 of 54) overall, including better than 73 percent on its two-point attempts. Justin Wright-Foreman and Rokas Gustys had 20 each on a combined 18 of 23 shooting, as the Pride's stars led four players in double figures. "I don't know how many shots they made, but a high percentage of them were layups, dunks at the rim," Spiker said. "Until we do a better job of that … we'll see this result." He added: "If we score 86, it needs to be enough to win. We're not defending enough." Drexel scored at least 75 points in four of those conference games, but gave up at least 90 in three of those. Their only win so far was an 87-82 OT win against preseason favorite College of Charleston on Jan. 5. Trailing by 14, the largest deficit of the game, with 3:37 remaining on Saturday, Drexel made one final push, cutting the Pride's lead all the way down to two on a steal and layup by Tramaine Isabell with 38 seconds to go. But Hofstra hit five of its six free-throw attempts in the final 36 seconds, and that was enough to hold on for the win. "I thought we competed better for bigger stretches," Spiker said. "[But] the result is the same, and that stinks, that's not what we want. "We showed we can go toe-to-toe, but we haven't finished out possessions. If you don't finish possessions, you don't finish games." The Dragons (7-12, 1-5) struggled with Gustys, one of the CAA's all-time best interior players. The 1,000-point scorer and rebounder had a monster game with 20 points and 16 boards, taking advantage of Drexel senior Austin Williams' three first-half fouls. Isabell led the Dragons with 25 points. Drexel senior Sammy Mojica became the 37th player in school history to surpass 1,000 points, finishing with a career-high 22 points. He also moved into 10th place on the school's career three-pointer and steals lists, hitting three long-range shots and picking up a career-high five steals. The Dragons return to action at 7 p..m. Thursday with a trip to Towson (13-6, 3-3).